Send this executive fruit &�wine. The Perfect Wine and Fruit Basket. Two bottles of Chardonnay, Merlot, or a combination of both wines accompany this classic fruit and gourmet basket. The second bottle of wine is guaranteed to make this basket a memorable gift. Perfect for a corporate thank-you or any other occasion, this basket is filled with fresh seasonal fruit such as apples, oranges, bananas, grapes, and kiwi (as available). Sprinkled with a selection of gourmet items such as cheese, sausage, and crackers or candies, this gift is sure to impress. Exact basket and fruit selection may vary by season and delivery location. 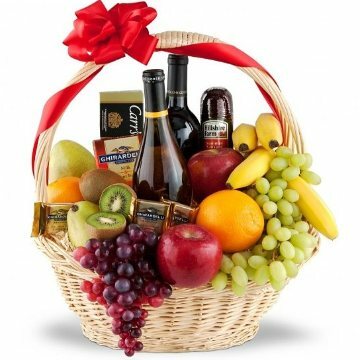 This Wine and Fruit Basket has been purchased most frequently by our customers for the following occasions: Thank You, Christmas, Birthday, Get Well, and Congratulations.